You made it! Your registration is now complete. 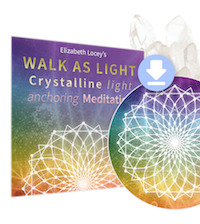 Below please find the audio of the “WALK AS LIGHT” meditation AND some information about your optional personal Crystal Blessing with Elizabeth. We suggest downloading the audio but you may also return to this page to play or download it at any time. An optional expansion on the crystalline meditation is to have me offer you a Crystal Blessing. This is when you and I get on a call together, and the crystals desiring to support you at this time come forward with their Love. It’s like a crystalline tarot reading, except that it doesn’t just give information; it offers immediate healing. How this works is: I connect to your energy and ask the thousand or so crystals in my bowl to respond with their blessing. It’s the exact energetic support you need in the moment, and it is UNCANNY how accurate these blessings are. The stones don’t lie! 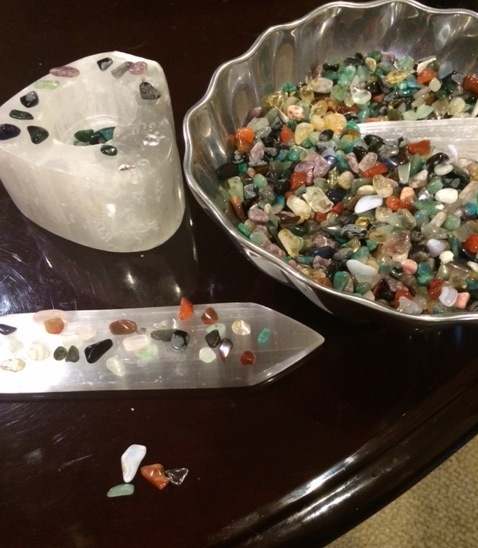 After I pull your stones, I always lay them on Selenite (those white stones in the photo below and also in the Soul Star level of the WALK AS LIGHT meditation) to clear and charge them before putting them back in the bowl to be available for the next person. The bowl itself is also always being cleared and charged by additional Selenite so that there is never any energetic bleed-through from one person’s blessing to another. It is a time commitment for you, and a time + energy commitment for me, so please do not sign up for one if you are “meh” about it. Some people have been having trouble with the Zoom link, IF you are in the US, I am happy to call you on the phone instead; if this is the case, reply to the confirmation email with your phone number and a request to do it that way. Copy it and paste into your calendar! Also, this is a room, like a hotel room. Be aware that you might walk in on someone else if this isn’t your scheduled time. Also, please only sign up if you’re excited to receive this. I have had several no-shows, and this does not feel good. I am happy to give of my time and expertise to connect you to the magick of crystals, but it is out of alignment to ask me to show up for you and then you not show up for yourself. If you click it at or just before your appointment time, it will download seamlessly to your phone or computer and take you straight there. I cannot wait to share the meditation and crystals with you.